No two people are the same, so why should all of our apartments look the same? From classically cool and comfortable to quirky and artsy, at Monroe Street Market, our apartment homes have as much personality as the people who live in them. Jay-Z may have 99 problems, but we have 99 floor plans across 3 unique buildings, so you can truly match your style to your new place. Get to know the different personalities of our three buildings so you can find your perfect match! Consider yourself a creative or want to live “La vie Bohème”? Brookland Works is the place to express yourself, with floor plans that inspire. Concrete floors and exposed ceilings are what you can expect from these artistic loft spaces. If you venture just a few steps from your apartment you can find our acclaimed Arts Walk, home of 27 artist studios and 3000 square feet of workspace for artists, events, and more. Portland Flats is our very own version of New York’s famous Flat Iron building. It brings all the classical style of old New York to Brookland in a way that is anything but stodgy. Portland Flats is full of grand boutique apartments with elegant finishes perfect for people who want elegance in their home without the pretension. Cornerstone is the vibrant hub of the Monroe Street Market community. These apartments are effortlessly cool, contemporary, and full of eclectic touches that are comfortable but far from boring. If you want an apartment that has a bit of everything, with easy access to all the unique amenities that Monroe Street Market has to offer, Cornerstone is the place for you. While these buildings have their own flair, all apartment homes at Monroe Street Market come with fantastic features like oversized windows, designer hardwood floors, and ENERGY STAR® appliances. In addition, we are a pet-friendly community with over 16,000 square feet of amenity space for you to explore. 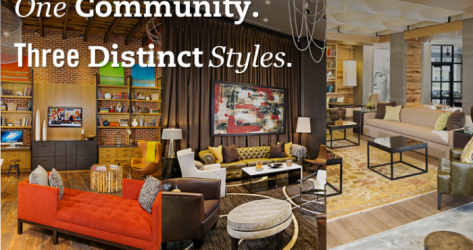 No matter what your style is, Monroe Street Market has you covered with different apartment styles for different personalities!